Sri Chinmoy Library – Online books. Sri Chinmoy Races – Home of Sri Chinmoy Marathon Team. Sri Chinmoy Centre – Website of Sri Chinmoy Centre. Sri Chinmoy – The message of inner and outer peace. 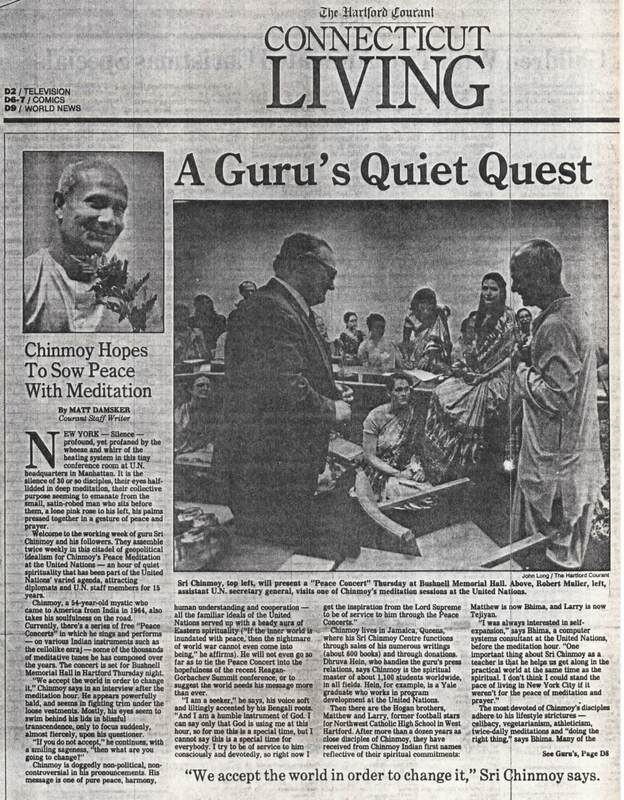 1997 Hindu Renaissance Award – to Sri Chinmoy. Sri Chinmoy Library – Browse from over 1,500 books of Sri Chinmoy. Sri Chinmoy Art – Selections from Sri Chinmoy’s art. Sri Chinmoy Books – Books of Sri Chinmoy for sale. 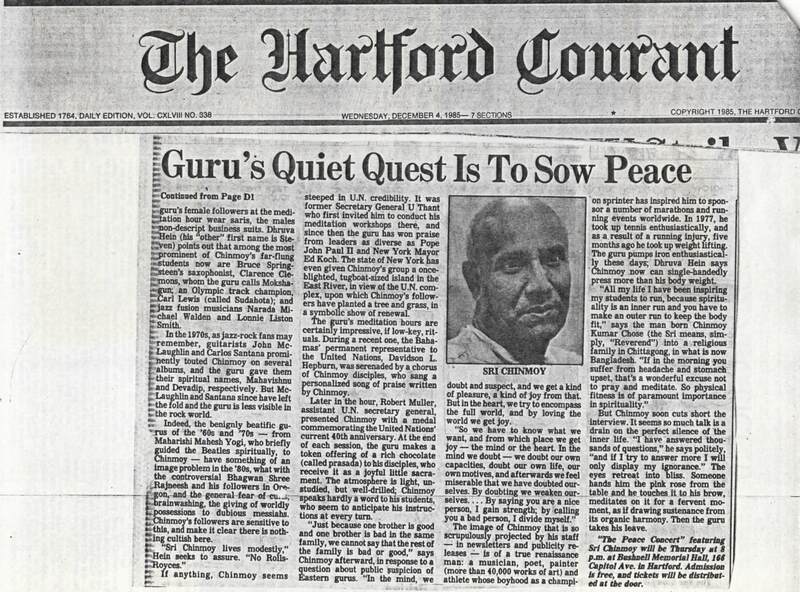 Yoga of Sri Chinmoy – Yoga of Sri Chinmoy. Radio Sri Chinmoy – Music of Sri Chinmoy and Sri Chinmoy Centre. Heavy Hearted – Weightlifting feats of Sri Chinmoy, originally published American Fitness. Challenging Impossibility – film about weightlifting of Sri Chinmoy. A Monument to Strength – Tribeca film festival on Sri Chinmoy’s weightlifting. Inspiration Letters – Selected writing. Ananda Fuara – Vegetarian restaurant in San Francisco. Jyoti-Bihanga – Vegetarian restaurant in San Diego. Perfection-Satisfaction-Promise – Vegetarian restaurant in Ottawa. Silence-Heart-Nest – Vegetarian restaurant in Seattle. The Blue Bird – Cafe in Auckland, New Zealand. The Lotus-Heart – Cafe-Restaurant in Christchurch, New Zealand. List of meditation sites – list of all city meditation sites. Let’s Meditate – meditation workshops around the world. Music groups at Radio Sri Chinmoy. Write Spirit – Ancient wisdom, modern inspiration. Light and Liberty – Wisdom of Thomas Jefferson. Tatyana Lebedeva at the IAAF –an interview with five-time Olympic medallist a close friend of Sri Chinmoy. I am not the body, I am the soul – breaking limits with Sri Chinmoy. Interview with Ashrita Furman at What is Enlightenment? Las Vegas Sun June 02, 2005 – Harmony Runners scheduled to hit D.C. on Friday. 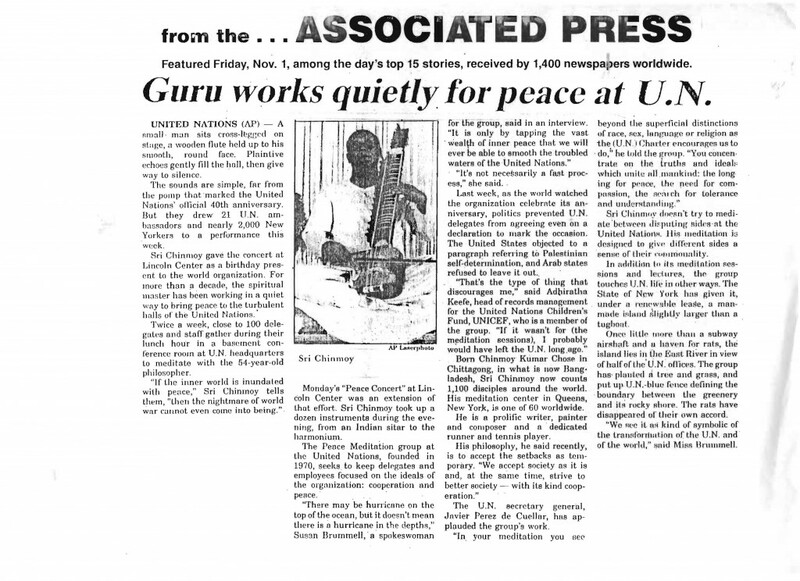 Spirituality at the United Nations – written in the 1970s by Mr. Donald Keys, when he was a speechwriter for Secretary-General, U Thant and Founder/President of Planetary Citizens. United Nations S.R.C. Society of Writers – past recipients.